Caption slip reads: "Photographer: Swaim. Date: 1958-04-17. Reporter: Swaim. Assignment: crippled singer has baby. 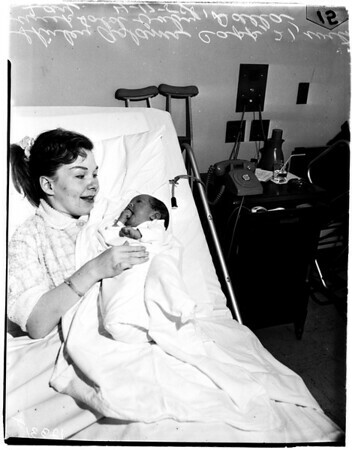 15/16/19: Shirley Adams Capp, 21, shown in Methodist Hosp, Arcadia, with week -- old baby, Dalla Fay. Shirley's singing career interrupted 3 times, first at age 10 by crippling infectious arthritis, second by marriage 13 months ago, third by birth of daughter".